Marlin (voice of Albert Brooks), an anxious and overly protective clownfish, and his son Nemo (voice of Alexander Gould) become separated in the Great Barrier Reef when Nemo goes against his father's wishes and swims off. He's unexpectedly taken far from his ocean home and dumped into a fish tank in a dentist's office—reaffirming all of Marlin's worst fears. 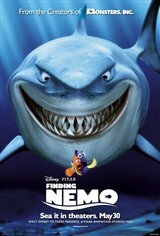 Marlin embarks on a dangerous mission to save his son, meeting many interesting sea creatures along the way. Buoyed by the companionship of Dory (voice of Ellen DeGeneres), a friendly-but-forgetful Pacific regal blue tang, Marlin embarks on a dangerous trek and finds himself the unlikely hero of an epic effort to rescue his son—who hatches a few daring plans of his own to return safely home.